Hello! 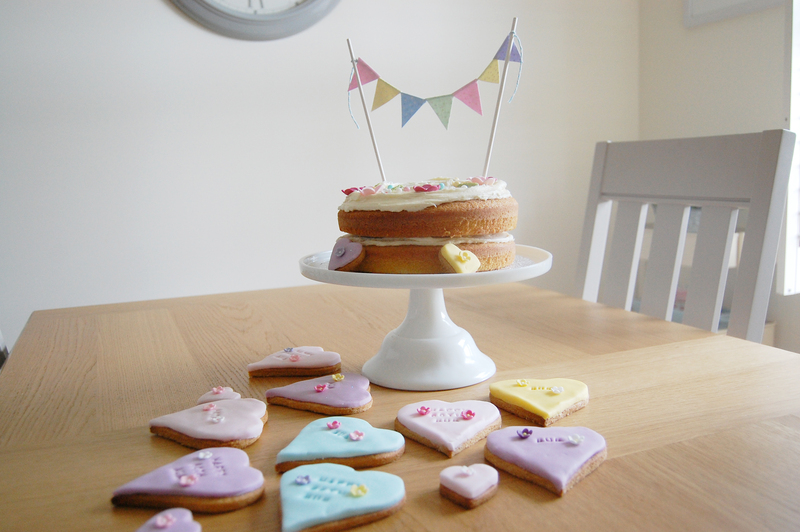 In this post I’m going to show you how to make this delightful cake bunting you see here, with an easy to follow tutorial. If you have a special occasion coming up such as a birthday, wedding, christening, anniversary etc then this is perfect for you! As you may have guessed from the above photographs, my Mother-in-law held a 60th birthday party over the weekend and I offered to bake her a cake. I was so happy when she accepted my offer, even more so when she told me she didn’t have anything specific in mind. This allowed me to have complete creative control which is perfect for me. After spending weeks on Pinterest, I was feeling completely inspired (if not a little overwhelmed at the options) and I finally drew up a plan of what I wanted to do. As you can see from the pictures, I chose a simple vanilla layer cake with buttercream. I used a Primrose Bakery recipe from their first book, ‘Cupcakes from the Primrose Bakery’ and can thoroughly recommend all of their books for reliable recipes. I also made some vanilla biscuits from ‘The Biscuiteers, Book of Iced Biscuits’ recipe book, which I can also thoroughly recommend if like myself, you have limited experience of making biscuits. I decided to get creative with the biscuit recipe and add a fondant topping which the Biscuiteers recipe book does not cover. I purchased a set of inexpensive letter/number biscuit stamps from Amazon alongside some complimenting sugarcraft decorations for the cake and the biscuits. 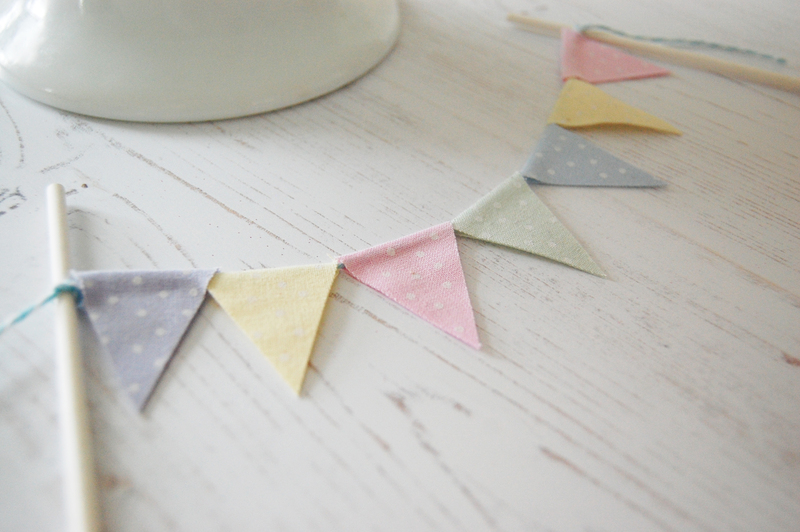 Due to the amount of detail in the cake and biscuits, I opted for some simple fabric cake bunting in complimentary colours, which I am going to show you how to make here. I have a sewing machine, but I will openly admit I am not a huge fan of sewing. 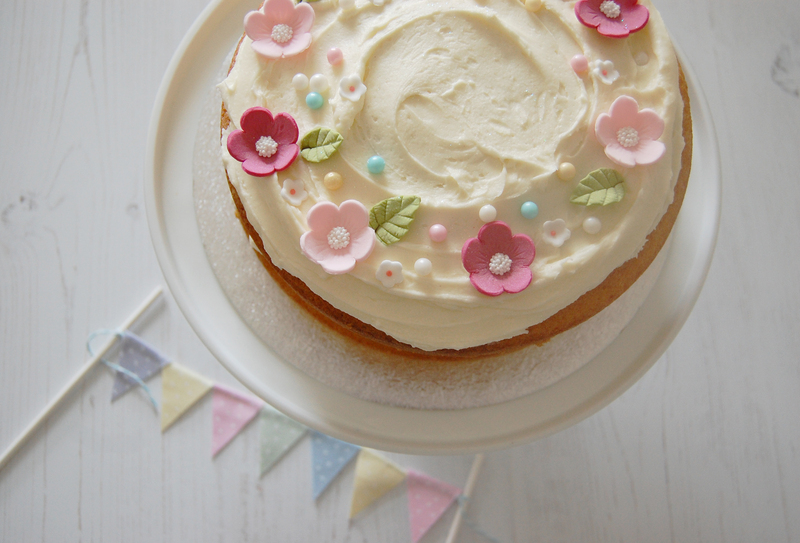 If you feel the same (I hear you), then this no sew fabric cake bunting is perfect for you. 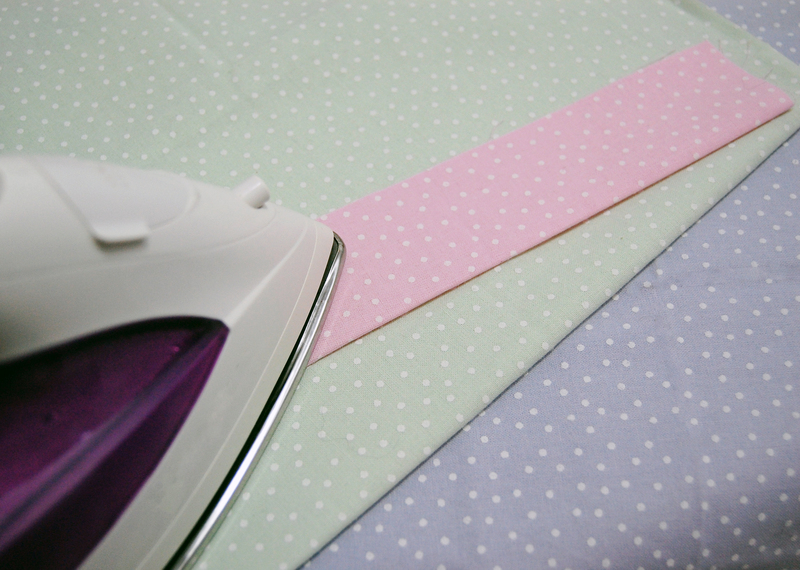 To begin with, turn your iron on and decide which fabrics you intend on using. 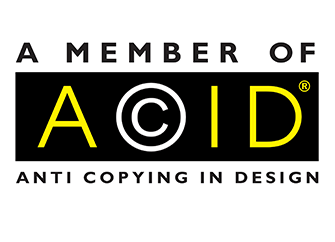 I opted for 7 triangles in 5 different colourways but you may decide to do this differently. Turn your fabric onto the wrong side (the side not containing the pattern) and with your ruler and pencil, you’ll measure and mark off your first strip of fabric. Mine measured (Length) 18 centimetres x (Width) 10 centimetres. (As opposed to using a pencil, you can purchase a specific pen for drawing on fabric which allows any marks made to vanish. However, as the side we are drawing on is not visible, this isn’t necessary). 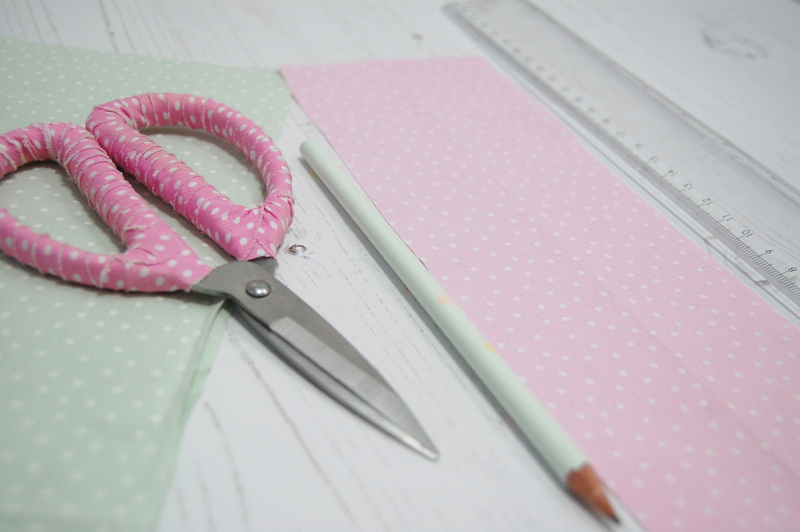 Once you’ve finished measuring your strips, take your fabric scissors and cut them out so you have something which resembles the pink piece of fabric shown below. Now the iron should be hot, take your ironing board, fold the strip in half lengthways and iron, until you have something which resembles the pink strip of fabric below. If you have multiple strips, repeat this process for all of them. Open each strip of fabric. You now need to measure and cut the bondaweb, positioning it textured side down on one side of the fold. You will need one piece of bondaweb per strip of fabric. If you have cut your fabric strips in accordance with the measurements specified above, each strip of bondaweb should measure (Length) 18 centimetres x (Width) 5 centimetres. Once the bondaweb is positioned, take your iron and iron this onto the fabric. You must ensure you have measured the bondaweb to the exact size and there are no overlaps, otherwise this may leave a sticky residue on your iron, fabric and ironing board etc which will transfer. Your strips should now resemble the ones shown in the above photograph. Take your paper scissors and cut out a triangular shape out of paper or card. This will be your template for each flag. My triangle measured 4 centimetres (at the widest part) and 4.5 centimetres in length, but they can be cut to any measurement within the size of the fabric strips. Place the paper triangle template on your first strip of fabric and lightly draw around it. You can use a light coloured pencil to do this or a vanishing/air soluble fabric pen. Repeat the process until you have marked out all of your triangles on each strip of fabric. 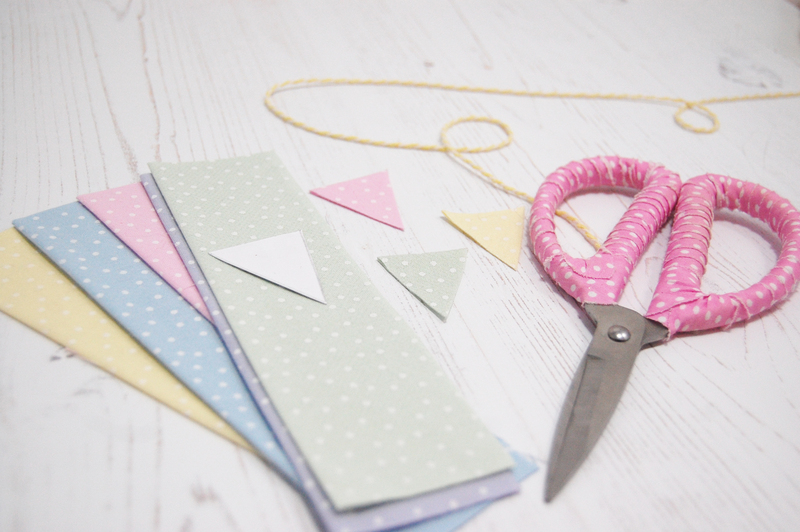 You can then begin cutting out your triangles which should resemble the ones shown above. (p.s the bunting is easier to assemble if the widest part of the triangle is positioned and cut on the fold of the fabric). Once you’ve cut out all of your triangles, position them into the order you’d like them to be. Take your twine or string and cut to the width you’d like your bunting to be, ensuring you’ve left approximately 10 centimetres on each side for tying the bunting on to the sticks. Once you’ve cut your thread or twine to size, take a darning needle and thread the twine/thread through each triangle one at a time. You can easily reposition the triangles during this stage if they are a little close together, so don’t worry. 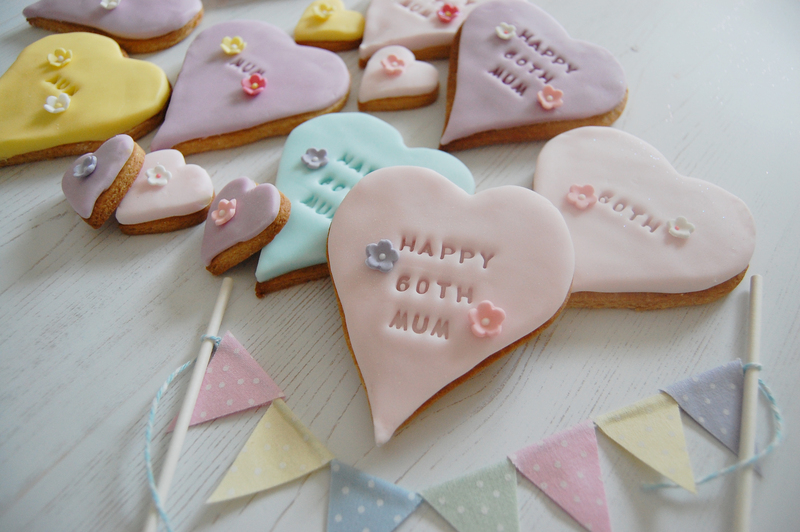 Once they are positioned how you’d like them, tie each end of the bunting onto your sticks – you can just tie a small knot around the end of each cake pop stick and this will be substantial. Any excess thread/twine can be cut off. I like to have some hanging down at each end but this is personal preference. Voila! You’re now done and you can proudly position it on your cake! I hope your cake bunting looks beautiful. 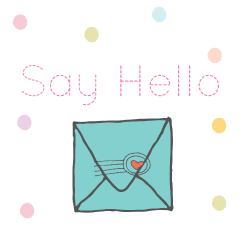 I’d love to see your creation, so feel free to post it here as a comment or hit the ‘hello’ button above to send me a photograph of it via email. 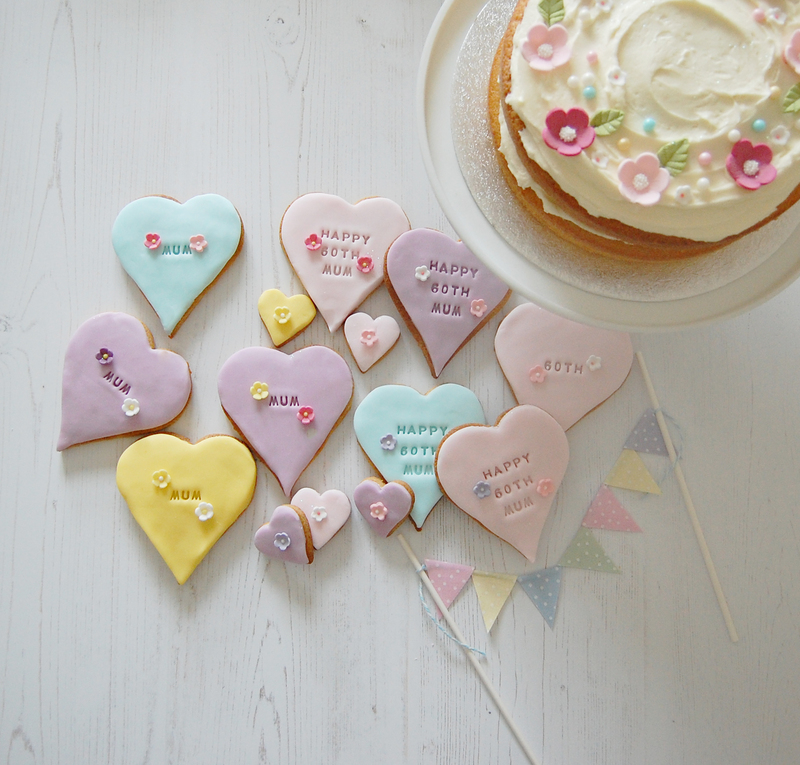 Happy baking/crafting!